I had painted the first Napoleonic Danish ship in 1/2400th scale. I covered the painting of these in two previous posts here, Danish Napoleonic Ships – the First 74 – part 1 and Danish Napoleonic Ships – the First 74 – part 2. These described the assembly and painting of a single vessel – my prototype. Previous to the painting though, I started to lay out my thoughts in Danish Napoleonic Naval Questions. I had decided on the Danes as they were a little different to the run of the mill British/French/Spaniards and besides, I had just finished phase one of my modern NATO Danes. Well, I didn’t get any answers but I have been searching myself for the information. I don’t have statistics for the Danish vessels in the Trafalgar Naval Wargames Rules format yet … still. However, this may be academic as I purchased a copy of Langton Miniatures fast play naval rules, Signal Close Action – Fast Play. I also purchased a copy of the regular Signal Close Action Rules as well. The Orlogsmuseet (Royal Danish Maritime Museum) noted that the Nelson colour schemes were not adopted until after the war, in part due to the expense of the paint. The colours most often used for decoration were green, blue and red. Langton suggests using a buff or basic wood colour for the sides of vessels. I am taking this to assume that the cross spars were also plain wood. The names of the vessels and their rate have been fairly easy to determine. 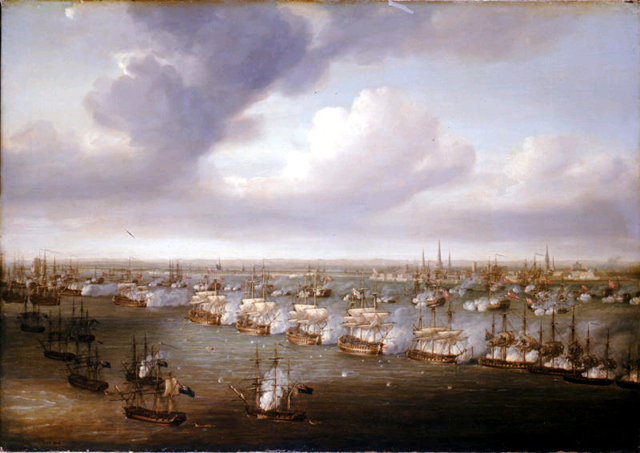 There is a good list of the vessels in involved in the Wikipedia article on the Battle of Copenhagen. Worthy of a view as well is the Danish Military History website. OK, so, where does that leave me now. I could argue that I have a perfectly good English 64 painted up (although I will need to change the ensign flying from the mizzen). In any case, I shall now be able to ensure that future vessels as they are painted are closer to the way they appear to have been historically. Naturally, I will photograph them and place them here in the Hole in the future. I would also like to thank Rod Langton for sharing the information. Langton makes absolutely the best, bar none, 1/1200th scale sailing vessels. Have a look at some of the eye candy at Langton Miniatures. I know I will be using Langton’s 1/1200 Mediterranean galleys when I get around to building my Renaissance naval collection.